On your second day here, get to know the fascinating history of Freedom Trail. For reviews, maps, traveler tips, and other tourist information, go to the Boston day trip planning app . Washington DC to Boston is an approximately 3-hour flight. You can also do a combination of train and flight; or drive. Plan for a bit cooler temperatures traveling from Washington DC in July, with highs in Boston at 83°F and lows at 67°F. On the 3rd (Wed), wrap the sightseeing up by early afternoon so you can ride a ferry to Provincetown. Kids will appreciate attractions like Cape Cod National Seashore and Race Point Beach. 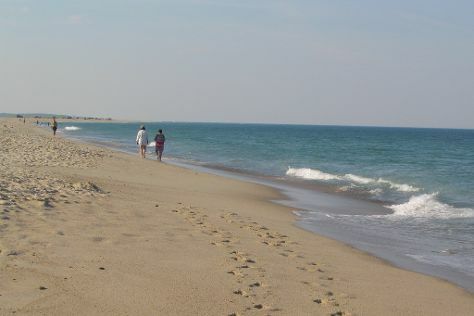 Get out of town with these interesting Provincetown side-trips: Salt Pond Visitor Center (in Eastham) and Nauset Beach (in Orleans). There's much more to do: enjoy the sand and surf at Herring Cove Beach, browse the collection at Provincetown Library, tour the pleasant surroundings at Marconi Beach, and pause for some photo ops at Pilgrim Monument & Provincetown Museum. To find more things to do, ratings, and tourist information, go to the Provincetown day trip planner . Traveling by ferry from Boston to Provincetown takes 1.5 hours. Alternatively, you can fly; or drive. In July, daytime highs in Provincetown are 79°F, while nighttime lows are 64°F. Finish your sightseeing early on the 6th (Sat) to allow enough time to drive to Sandwich. Sandwich is a town in Barnstable County, Massachusetts, United States. On the 7th (Sun), get curious at Sandwich Glass Museum, see the interesting displays at Heritage Museums & Gardens, then tour the pleasant surroundings at Old Silver Beach, and finally contemplate the waterfront views at Cape Cod Canal. On the 8th (Mon), you'll have a packed day of sightseeing: contemplate the long history of Plymouth Rock, get engrossed in the history at Plimoth Plantation, then contemplate the long history of Hoxie House, and finally grab your bike and head to Shining Sea Bikeway. To find maps, traveler tips, more things to do, and tourist information, use the Sandwich trip itinerary website . Traveling by car from Provincetown to Sandwich takes 1.5 hours. Alternatively, you can take a bus. In July, daytime highs in Sandwich are 80°F, while nighttime lows are 64°F. Cap off your sightseeing on the 8th (Mon) early enough to travel back home.